For most T&L stories, we turn to our readers for their advice and insight about stronger and smarter tech integration. For BYOD (bring your own device), however, we’ve already done that more than a few times. That’s why we thought it would be interesting to spread our wings and seek advice from a different group: the business community. Like K-12 schools, businesses are trying to find ways to accomplish tasks on a shoestring and do more with fewer employees. As a result, many companies have embraced BYOD. We’ve asked a few to share their stories. Shawn Faulkingham is director of IT systems for Indoff Incorporated (www.indoff.com), a national sales company with more than 400 employees. As a longtime BYOD manager, Faulkingham offers these tips. Shawn Genoway is senior director of worldwide IT service delivery and network operations centers for Citrix (www.citrix.com), the virtualization company. Here are some of his thoughts on BYOD. What makes BYOD successful is that we’ve stopped managing the device, and we are now managing the service. The minute you need to install a corporate-owned app on someone’s personal device is when it breaks down. Remember: It’s not “yours” under BYOD. You’re not ready until you divorce yourself from the device. BYOD will save you a lot of time. When we rolled out Windows 7 to our 6,000 machines, it took three months. With a virtual app or desktop, you manage one location. BYOD can also save you money. We cut costs by 18% worldwide with our BYOD program. Those savings stem from no longer having to do any of the following: add software, update patches, add updates to desktops, image new machines, ship machines back to the employees, purchase warranties, and dispose of devices. We don’t handle those tasks for more than 25% of our company now. We thought BYOD employees would ask for hardware support but that hasn’t happened. I’ve seen corporate-issued PCs covered with salad dressing. 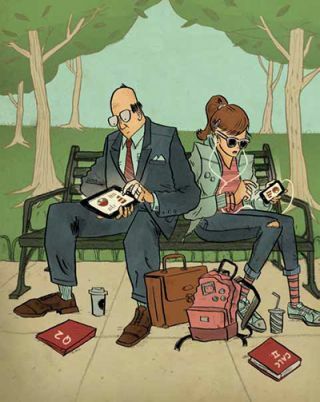 You don’t see that with personal devices. My teams ended up writing better support documents. I want employees to be able to buy a device, bring it home, and follow detailed steps for setting up their work email, connecting to the network, and so on. I did a lot of education for the end-users but not enough for the managers and received complaints. I then spent more time working through misconceptions. My advice? Make it as simple as possible. If you say, “You’re going to be self-sufficient and not call the service desk for hardware support,” you have to spend a lot of time up front making sure your documents sing. Gyutae Park is co-owner of Money Crashers Personal Finance (www.moneycrashers.com), a Web site that strives to educate individuals in making wise choices about credit, debt, investing, education, real estate, insurance, spending, and more. Tech & Learning (TL): How many employees does Money Crashers have and when did they begin BYOD? Park: We have 35 employees. Some of them began BYOD approximately one year ago. TL: What are some of the benefits of BYOD from a managerial and an end-user standpoint? Park: My employees like that they can now complete their work by using their own personalized devices, which they tend to keep regularly updated. They also really like that they’re no longer tied down to their office PCs. TL: What are some of the negatives? Park: They are now responsible for the cost of maintaining their mobile devices. My company is considering absorbing a portion of the monthly cost for employees. TL: How did you prepare for BYOD? Park: First, we came up with a detailed BYOD policy. This includes what we determined to be acceptable use of mobile devices while on company time, as well as necessary security measures. We also included a section on how our data would be retrieved if an employee were to leave our organization. Additionally, we decided that we would not allow any devices to be used for work purposes that were rooted or jail broken. We do not have a separate network for our BYOD staff. We hired an IT staff member to take care of the majority of the transition and provide tech support. He inspected each device for the proper security features—including password protection and remote swipe—and then served as a support person. TL: Any advice for our readers on making BYOD successful? Park: Consider establishing a separate network for students for security reasons, as well as a comprehensive BYOD policy that includes which types of devices are acceptable, what security measures are needed, when and where the devices are allowed to be used, and whether IT support is provided. This document should be signed by both the student and the parent. It’s also important to get parents involved before going ahead with any BYOD initiative. It will be new and uncharted territory for many parents, and they’d certainly like to know the specifics. 75% of organizations deploying BYOD report improvements in employee productivity, customer-response times, and work processes. 70% say BYOD is a catalyst for teamwork and collaboration. 73% say BYOD helps employees be more creative. Mobile device management (MDM) software lets your IT staff manage mobile devices and keep the network safe. Here are a few MDM packages to look into.